The most spectacular event at the Rio Carnival is undoubtedly the samba parade at the Sambadrome, a combination of camaraderie and competition which anyone can ill afford to miss. Carnival Sunday and Monday are the best days at the Sambadrome with samba schools from the Special Group vying for the year’s championship title! This is preceded by the samba parade by the Access Group on Carnival Saturday. Visitors are welcome to join in the celebrations and even be a part of a samba school at the parade. When King Momo begins to samba, you can be sure everyone else does. The Rio Carnival begins with a great display put up by children’s samba schools. These schools are branches of the bigger samba schools that are formed by children of each community. Since the early 1980s, the children have been the opening act at the Rio Carnival. Entry to the Sambadrome is free on Friday night. However, this could be one of the most memorable evenings on a trip to Rio.The children’s samba parade has all the ingredients of the big samba schools with equally elaborate costumes, floats, a theme, song, and everything else that the bigger nights are all about. What’s intriguing about the entire spectacle is that the songs are written by children, while the floats and costumes are made by them under the supervision of the adults.12 Escolas de samba Mirins enter the parade each year with up to 2000 children in each school. The parade is well supervised by the adults, but the little ones do put up a grand show of their own. While the Samba Parade gives the children their chance to show off their talents there is a bigger motive behind their participation.The schools are designed to complement formal education by providing children from the favelas and slums training in design, costume making, carpentry, lighting, sound, music, dance, and other skills practiced by the samba schools. Watching them perform with confidence at the Sambadrome is indeed a spectacle worth watching. Go ahead, salute the brave kids of Rio, and join them at the Sambadrome. These amazing children will keep the flame of Carnival burning for generations to come. After the Children’s Samba Parade, it is the chance of the Access Group or Group ‘A’ to display their creativity and talent to the public. Some of these schools carry as much history, talent, and art of samba schools from the Special Group, with performances just as good as anyone else from the big league. Moreover, their motivation to perform stems from the fact that the winner advances to the Special Group in the following year.The 12 samba schools parade on Carnival Saturday in front of thousands of spectators who encourage the schools to move over to the Special Group. These schools are highly energized and turn out performances that are truly mesmerizing, to say the least. Among the schools in this group are Unidos de Padre Miguel, Império Serrano, Império da Tijuca, and Caprichosos de Pilares, among others.Their fierce fight for an entry into the Special Group sets the Sambadrome alive on Carnival Saturday, one extravaganza that is well worth the time and money. Frugal spectators who want to experience the Carnival in all its glory would be wise to attend this competition as it is no less exciting or energizing than the Special Groups and a lot less expensive. Samba Schools in Group "B"
On Carnival Tuesday, a day after the samba schools in the Special Group have their special moments of glory, the smaller samba schools take over center stage at the Sambadrome. Each school has about 1,500 participants; however, that does not deter them from putting up a grand show. The samba parade is meticulously planned and executed as each team vies for a place in the Access Group or Group ‘A’, the first step towards parading in the big league. Ornately decorated floats and elaborately costumed dancers portray the school’s creativeness through the chosen theme, much like the Special Group. 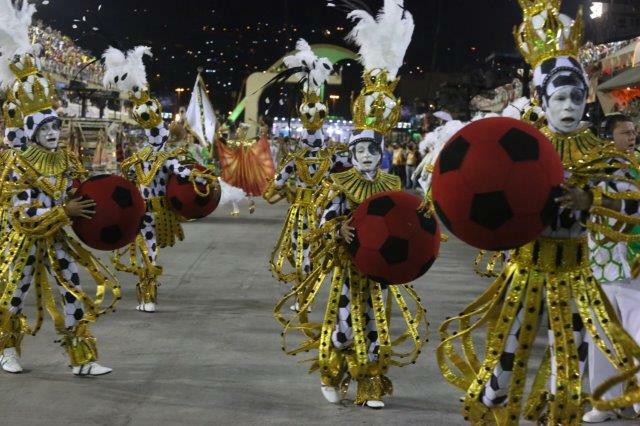 Watching samba schools like Mocidade, Salgueiro, and Beija-Flor in action at the Sambadrome on Carnival Monday and Carnival Tuesday is an experience to remember forever. This is serious competition at the highest level with the very best samba dancers and musicians taking center stage. 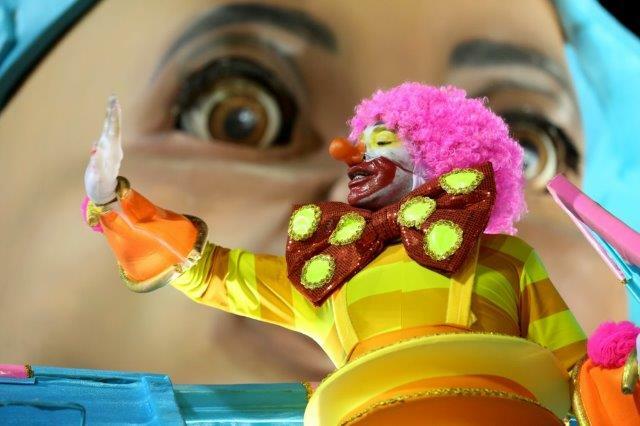 The competition is spread over two days with six schools parading on each day.Many of Brazil’s celebrities join in the celebrations on floats belonging to their favorite samba school. Tickets are most expensive on these days, but sell out fast since these two days are more than worth the investment. Even though the event is televised worldwide, to experience the Carnival to the fullest, the Sambadrome is the only place to be. Twelve schools compete yearly in the elite group at the Carnival.The school member work year round to prepare for this celebration. Competition is extremely tough between the schools. The samba parade for the Special Group has become famous all over the world. Even celebrities from different nations have come to Carnival to enjoy the spectacle. Nicole Scherzinger, Paris Hilton, Gerard Butler and Madonna have all visited during Carnival. RIO CARNIVAL BEST DEALS. CHECK THEM OUT! When the results are out and the champion of the special group is decided on Ash Wednesday, the following Saturday the six top teams have their final showdown at the Sambadrome. This is considered the second best event to watch because there is no competition and the schools are free from the pressure to score points, giving them the chance to enjoy the occasion. However, the energy on the night is no different from Carnival Sunday or Monday.The bleachers are packed the celebrities and socialites from across Brazil and thousands of tourists flock to the Sambadrome for a chance to samba for one last time at the Sambadrome. One of the best ways to experience the essence of the Carnival is to attend the Champions Parade. These top six schools, assured of their victory, are able to relax and sing and dance in the true spirit of Samba. The samba parade at the Sambadrome is one of Brazil’s most important competitions. Each samba school works year round to perfect their routine for the delight of the judges and public. Results are posted on Ash Wednesday and the schools that do not earn sufficient points drop to the lower Group A-Access Group. Each judge awards points based on several categories: Percussion Band, Samba Song, Harmony, Flow and Spirit, Theme, Overall Impression, Floats and Props, Costumes, Vanguard Group and Flag Bearer.